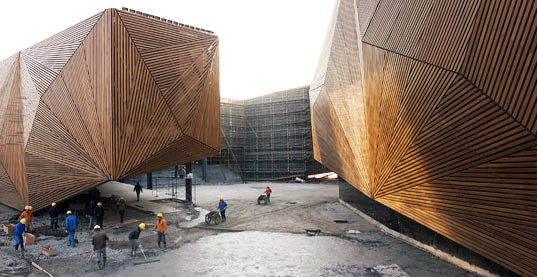 The 2010 World Expo in Shanghai is set to kick off in May and construction is nearly completed on the water-harvesting wood-clad Canada Pavilion. The famous acrobatic troupe Cirque du Soleil had a part in the design of the pavilion and will also be performing throughout the Expo. Many interesting pavilions have been designed for the expo around the theme of “Better Life, Better City” and Canada’s contribution includes a great set of sustainable design elements to compliment that. The 2010 World Expo in Shanghai is set to kick off in May and construction is nearly completed on the water-harvesting wood-clad Canada Pavilion. The famous acrobatic troupe Cirque du Soleil had a part in the design of the pavilion and will also be performing throughout the Expo. Many interesting pavilions have been designed for the expo around the theme of "Better Life, Better City" and Canada's contribution includes a great set of sustainable design elements to compliment that.